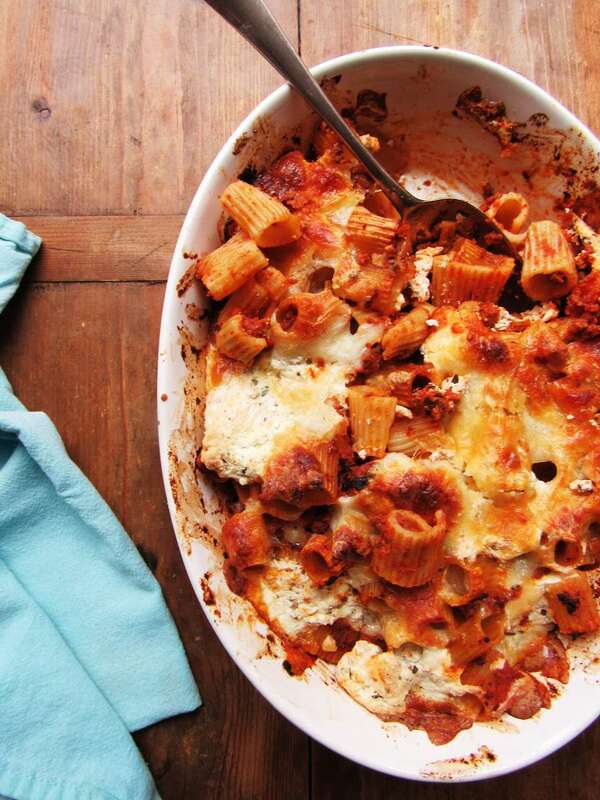 An Italian, red sauce-y, baked pasta dish is a hearty meal on a chilly night. This one is kind of like an unstructured lasagna. You can use any meat sauce (or even a vegetarian tomato sauce) in place of the bolognese. Just make a simple green salad and you are good to go. You can use rigatoni, ziti, penne, whatever you like for the pasta – let your kid pick the shape. Kids can also measure the ingredients, and slightly older kids can grate the mozzarella. Add some red pepper flakes if you want a bit of a kick. You can assemble this dish in the morning or even the night before and keep it in the fridge, then bake it right before serving. Cook the pasta in a large pot of salted water according to package directions. While the pasta is cooking mix together the ricotta, oregano, basil, salt and pepper in a medium-sized bowl. Drain the pasta and return it to the pot. Add the bolognese sauce and stir to combine. Transfer the pasta to a shallow 2-quart baking dish. Spoon tablespoons of the ricotta mixture over the top of the pasta, tucking it down into the pasta slightly. Sprinkle the top with the grated mozzarella. Bake the casserole for about 30 minutes until everything is hot and the cheese is melted and the top is golden brown. Serve hot.